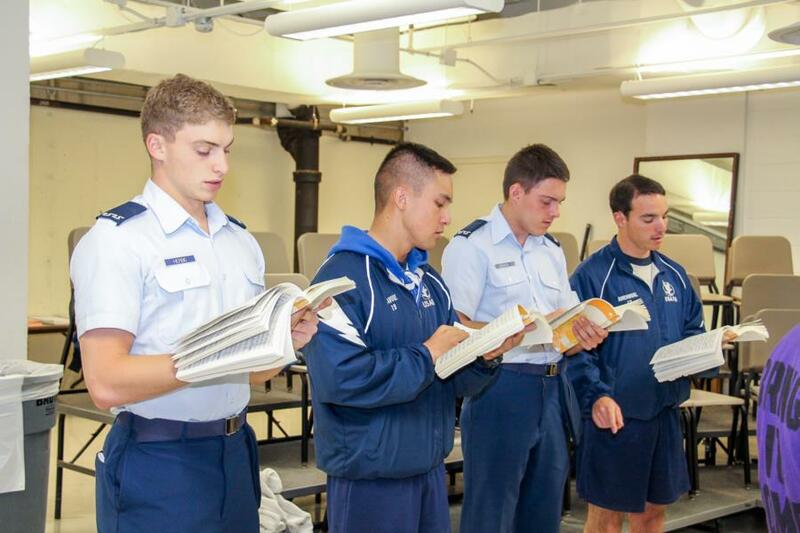 We recently had the opportunity to get coverage of the Cadet Chorale during a practice, below are some highlights from our glimpse into what goes on in a practice as well as some history about the Academy's Cadet Chorale. In early December the Academy will be having a Show in the Chapel and we can't wait to get more coverage of the Chorale as well as other choir groups here at the Academy! 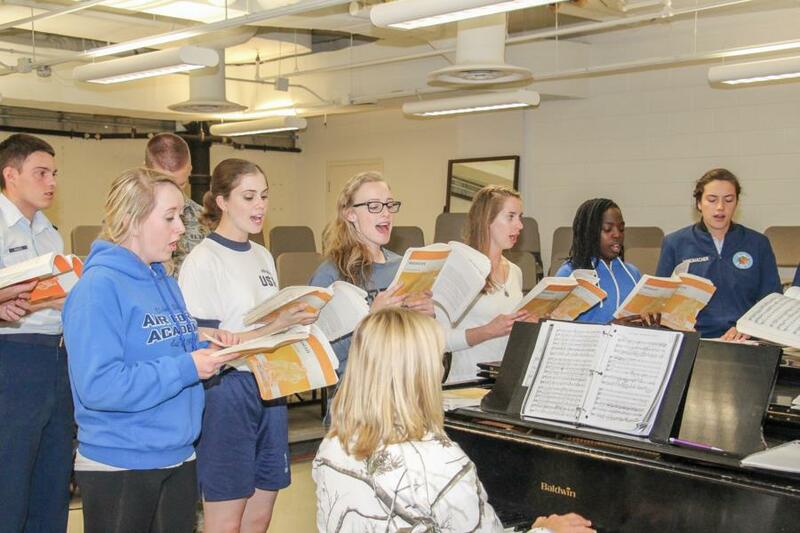 Members of the Cadet Chorale are among the USAF Academy's official ambassadors in choral music. Singers are accepted into the Chorale by competitive audition and are required to possess advanced skills in choral singing. In addition to annual and special concerts, the Chorale performs for visiting dignitaries and special civilian and military events. The Chorale started back in 1957 and the current director is only the 4th in the history of the Academy. The Cadet Chorale is the Academy's premiere choral organization. 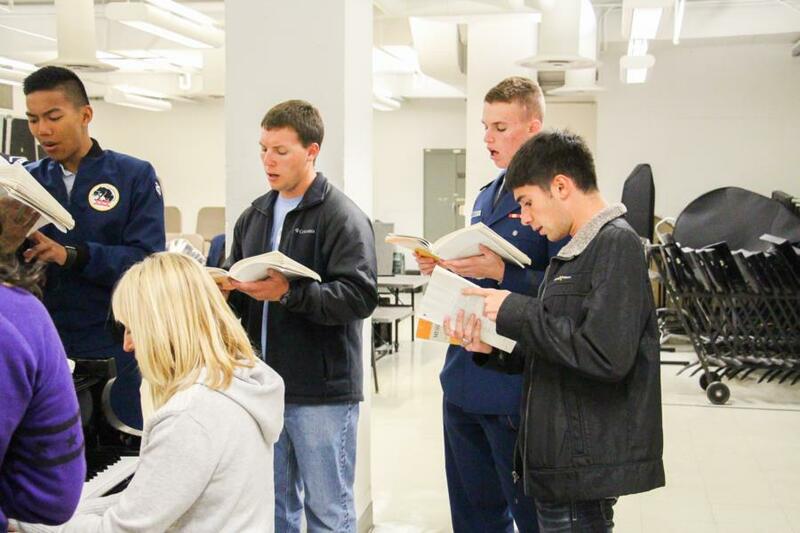 Cadets who indicate an interest in the Chorale are auditioned to determine musical ability and other special talents. Those who are accepted start musical training in a special section of their chosen group and become as active in the program as time, talent and interest allow. The Chorale's repertoire is large, including the greatest pieces from the whole heritage of music. It made its debut with the Denver Symphony in October 1958 and has since sung in nearly every state in the nation. 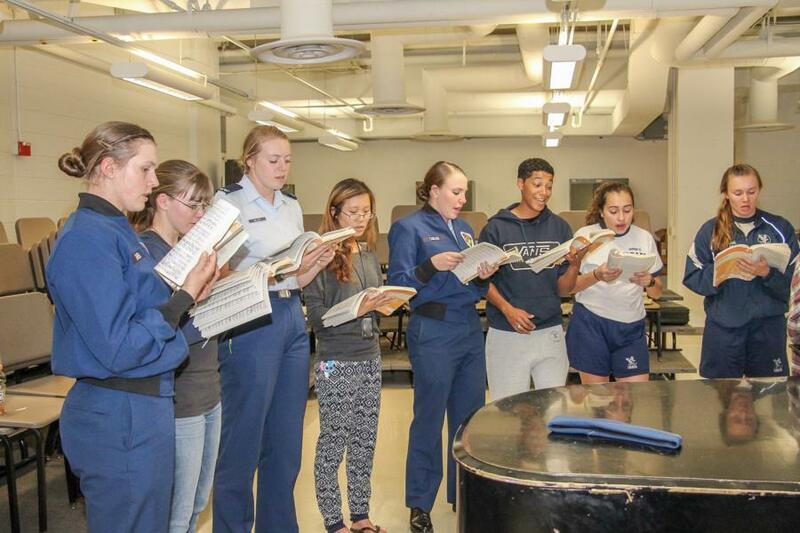 Since the Cadet Chorale's inception, television appearances over the years include a performance in 1983 with Carol Burnett and retired Brigadier General Chuck Yeager, the test pilot who broke the sound barrier. Where they performed in the Sixth Annual Kennedy Center Honors, honoring Jimmy Stewart, a retired Brigadier General in the Air Force Reserve. The Chorale joined Carol Burnett in singing "Easy to Love," the only song Stewart sang in his career of more than eighty movies. As well as "Auld Lang Syne," which was "part of the closing scene in the Frank Capra movie "It's a Wonderful Life," in which Stewart starred." The 24th Country Music Awards Ceremony in 1989 where the Cadet Chorale performed "This is My Country". In 2005 the Air Force Academy’s Cadet Chorale teamed up with the Naval Academy Glee Club, West Points Choir, and the Coast Guard Academy to perform the National Anthem at Super Bowl XXXIX in Jacksonville, Florida. This was the first time the four academies had performed together since former President Richard Nixon’s 1973 inauguration ceremony. Just to name a few.. The links below will show you the performances mentioned above. USAFA Cadet Chorale at 6th Annual Kennedy Center Honors Cadet Chorale comes out on stage at minute 11. We can't wait to see the current group of Cadets in the Chorale performing in the December concert! Be sure to tune in, in December for our coverage! To view the rest of our glimpse into a Cadet Chorale practice go to; Galleries - Extracurricular - Cadet Clubs. Or click the link below.